Future historians will probably regard Italy as the perfect showcase of a country which has managed to sink from the position of a prosperous, leading industrial nation just two decades ago to a condition of unchallenged economic desertification, total demographic mismanagement, rampant "thirdworldisation", plummeting cultural production and a complete political-constitutional chaos. 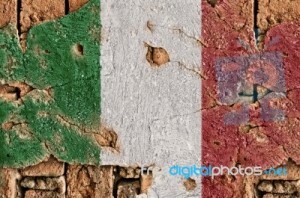 In a previous post on this very blog, the dire situation of Italy's economy has been briefly sketched. A few months later, the scenario of a serious disruption of the Italian state's finances is building up, with tax revenues contracting 7% in July, a deficit/GDP ratio projected again well over the 3% mandatory threshold and public debt well over 130% of GDP. It will get worse. The government knows perfectly well that the situation is unsustainable, but for the moment it is only capable to resorting to an extremely short-sighted VAT rate increase (to a staggering 22%), which will depress consumption even more, and to vague proclaims about the necessity of shifting the tax burden way from wages and companies to financial rents, although the chances of this to be implemented are essentially negligible. Throughout the summer, Italian political leaders and the mainstream press have hammered the population with messages of an imminent recovery (la ripresa). Indeed, it is not impossible for an economy which has lost about 8% of its GDP to have one or more quarters in positive territory. However, it is a profound distortion of elementary semantics to call a (perhaps) +0.3% annual rebound as "recovery", considering the economic disaster unfolding in the last five years. More correct would be to talk about a transition from a severe recession to some sort of stagnation. A recent study indicates that 15% of Italy's manufacturing industry, which before the crisis was the largest in Europe after Germany's, has been destroyed, and about 32,000 companies have disappeared. This data alone shows the immense amount of essentially irreparable damage which the country is undergoing. In the author's view, this situation has its roots in the immensely degraded political culture of the country's elite, which, in the last few decades, has negotiated and signed countless international agreements and treaties without ever considering the real economic interest of the country and without any meaningful planning of the nation's future. Italy could not have entered the last wave of globalisation under worse conditions. The country's leadership never recognised that indiscriminate opening to Asia's light industrial products would destroy Italy's once leading industries in the same sectors. They signed the euro treaties promising to the European partners reforms which have never been implemented, but fully committing themselves to austerity policies. They signed the Dublin Regulation on EU borders knowing perfectly well that Italy is not even remotely able (as shown by the continuous influx of illegal migrants in Lampedusa and the inevitable deadly incidents) to patrol and protect its borders. Consequently, Italy has found itself locked up in a web of legal structures which are making the complete demise of the nation practically certain. On the other hand, Italy has entered a period of constitutional anomaly. Because party politicians have brought the country to a near-collapse in 2011, an event which would have had severe consequences globally, the country has been essentially taken over by a small number of technocrats coming from the President of the Republic's office, the bureaucrats of several key ministries and the Bank of Italy. Their task is to guarantee stability to Italy vis-à-vis the EU and the financial markets at any cost. This has been so far achieved by sidelining both the political parties and the parliament to unprecedented levels, and with a ubiquitous and constitutionally questionable interventionism from the President of the Republic, who has extended his powers well beyond the boundaries of the still officially parliamentary republican order. The President's interventionism is particularly evident in the creation of the Monti government and in the current Letta government, which are both direct expression of the Quirinale. The point here is that, where politicians have failed, bureaucrats and technocrats hope to succeed. The illusion, which many Italians are cultivating by believing that the President, the Bank of Italy and the bureaucracy know better how to save the country, is now widespread. They will be bitterly disappointed. The current leadership, both technocratic and political, has no ability, and perhaps even no intention, to save the country from ruin. On the contrary, it would be easy to argue that Monti's policies have exacerbated the already severe recession. Letta is following exactly the same path. But everything has to be sacrificed in the name of stability. The technocrats share the same cultural backgrounds of the political parties, and in symbiosis with them have managed to rise to their current positions: it is therefore hopeless to think that they will obtain better results, since they are also unable to have any sort of long term vision for the country. They are actually the guarantors of Italy's demise. In conclusion, the rapidity of the decline is truly breathtaking. This is certainly not exclusive to Italy, as arguably most if not all Western countries are undergoing rampant thirdworldisation. Italy has simply less economic and social "capital" to burn in comparison to Germany and other Nordic countries. But it must be clear that, continuing on this way, there will be nothing left of Italy as a modern industrial nation in less than a generation. But just in another decade or so entire regions of the country, such as Sardinia or Liguria, will be so much demographically compromised that they may never recover. The founders of the Italian state one hundred and fifty-two years ago had fought and even died hoping to bring Italy back to a central position as a cultural and economic powerhouse within the Western world, as the one it occupied in the late Middle Ages and Renaissance. That project has now completely failed, with the abandonment the very cultural idea of having any meaningful political ambition going beyond the sheer day-to-day management on the one hand, and the messianic (but effectively pointless) universalism of saving the world on the other even at the expenses of one's own political community. Unless some sort of miracle occurs, it may take centuries to reconstruct Italy. At the moment, it seems to be a completely lost cause. Italy is pretty good... Maybe tourism can help! This page contains a single entry by Luciano published on May 11, 2014 11:00 PM. Philip Seymour Hoffman's Final Secret was the previous entry in this blog. The day the new computer went up (2nd time) is the next entry in this blog.